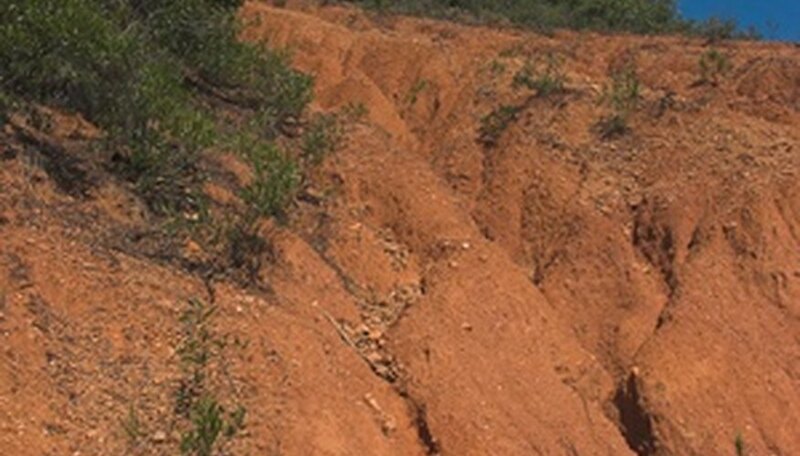 Soil erosion is the process where wind, water and human beings detach soil particles and deposit them somewhere else. Soil erosion, especially in agricultural systems, affects everyone throughout the world. When the layer of topsoil is removed, ground becomes unproductive and crops decrease. Soil is being swept away much faster than it can be replenished and is quickly becoming one of the most important environmental issues of the day. Rain splash erosion happens when raindrops move the soil. Rain splash only occurs if the rain falls with high intensity. Soil moves a few inches and usually is redistributed back over the surface soil. Rill erosion happens when runoff forms small channels that are several inches deep. Construction sites and sloping fields often show signs of rill erosion. Gully erosion starts when water accumulates and repeatedly flowers through narrow channels for long periods of time. Channels become deeper as the water removes the soil. Sheet erosion occurs when runoff travels over ground and moves particles that are dislodged by splash erosion. It is a gradual process and difficult to detect until it turns into rill erosion. Stream channel erosion begins as flows cut into the channel and make it deeper and continues until the channel reaches a slope. The channel will deepen further and the sides will begin to slough off, resulting in stream bank erosion. Controlling water erosion is done by maintaining proper plant growth, reducing tillage and direct seeding. Extreme measures for reducing water erosion are grassed waterways, a channel that is dug to help move water away down a slope. Grassed waterways are usually used on farms. Wind erosion is the physical wear and tear done to the earth's surface by wind. Wind erosion removes topsoil and redistributes it elsewhere. Soil is susceptible to wind erosion when there is a reduction of plant cover, when soil surface crust is broken and when organic mater in soil has decreased. Wind erosion is hard to measure but some signs are bare soil, drifts, exposed plant roots and dust clouds. Wind erosion can't be stopped, wind is a natural force of nature, but there are strategies that minimize wind erosion. Protective plant covering is necessary, without plants bare soil is vulnerable. Over-grazing must be limited if possible, animals eat the plants that help prevent wind erosion. Field shelter belts made from trees and tall grasses provide some extra protection against wind erosion by reducing the wind velocity. Tillage is the displacement of soil through the action of tilling soil in preparation for planting crops. Soil is moved from the top of the field down a slope, exposing the subsoil while burying top soil. Productivity of crops and yield of crops can be significantly effected by tillage erosion. Subsoil promotes poor growth in crops. Soil is no longer protected by crops which triggers weed growth and the possibility of water erosion. Controlling tillage erosion has only one real solution, using no-till systems that eliminate tillage completely. If tilling must continue, plow fields on a contour, reduce tilling speed and run tillage tools at the same speed and depth. Move topsoil from the depositional areas back to hill crests to reduce clay knobs and rocks.